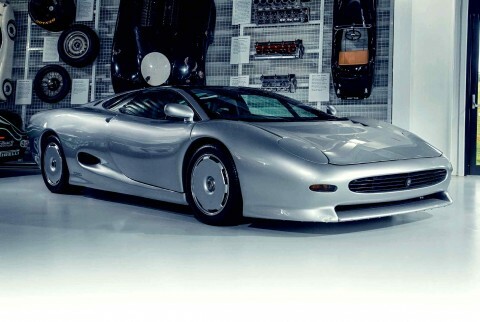 Jaguar XJ220 examined we compare original concept with road car. We study the original 1988 concept against a pre-production road car, spotting all the detail changes between the two XJ220. Words: Ian Seabrook. Pics: Matt Richardson. There had been a number of other supercars on the market that turned out to be disappointing. There was the #Jaguar-XJ220 , meant to have a V12 engine but later changed to a twin-turbo V6. There was also the Vector, an American supercar using a large #twin-turbo V8 and also not quite what was promised. So when the F1 finally came out, with the price tag more than double that of some other supercars, a lot of people thought, well, how good could it be? I was one of those sceptical people. Back in 1992, $810,000 for a car seemed crazy. You could get a Rolls-Royce, a Ferrari and a Lamborghini for that much money. #McLaren hoped to sell 300 cars but that scepticism, plus a worldwide recession, forced them to shut down after just 64 road cars, 28 race cars and a handful of prototypes. Just 106 cars in total. Another reason I didn’t pursue the F1 was because, at the time, it couldn’t be sold in America. The driving position was not legal, it hadn’t been Federalised and it didn’t pass California smog tests. In a classic case of not knowing what you’ve got till it’s gone, stories started appearing about the greatest car that nobody bought. Then a white knight appeared in the form of billionaire Bill Gates. After having trouble registering his Porsche 959, he helped introduce a law called Show And Display. What this law said was, any vehicle no longer in production, and considered to be of historical or technical interest, could be privately imported and driven in America no more than 2500 miles a year. That’s when I started looking. I called McLaren and spoke to a gentleman called Harold Dermott. ‘Any F1s for sale?’ I asked. I knew the car had been at McLaren about a month, with no takers. So I said to Harold, ‘Look, I’ll call you back in two weeks,’ secretly hoping the car would be sold by then and I would be stopped from making the biggest financial mistake of my life. Which was buying a car I’d never seen, let alone driven, in a foreign country with no guarantee I could bring it into the US. After two weeks I called Harold back. He said they still had it, although they’d had an enquiry that day. I don’t need to tell you that it was the most brilliant financial decision I ever made. When I purchased the F1 it seemed like the most complicated thing in the world. Imagine a car you hooked up to a computer, and a guy in England could look at a screen and tell you what’s wrong! Now, compared with modern supercars it seems almost simple, and in some ways it is. It even has a tool kit. On my website, Jay Leno’s Garage, you might have seen us removing the engine from the F1 to replace the fuel cell. We did it in 2013 and we did it again a week ago. It made me fall in love with the car all over again. Fixing even the simplest things on the F1, like replacing the battery, makes you feel like the mouse who took the thorn out of the lion’s paw. Is working on an F1 intimidating? Of course it is. But when you see it laid out on the garage floor, you realise it’s still a car and should be used as such. There may be modern supercars that are faster, but none is more seductive and intoxicating. The induction noise, the manual gearbox, the lack of driver aids such as #ABS and stability control, really make it the ultimate driving experience. I’m proud of the 12,000 miles I’ve put on my F1, and I like to think I’ll put a lot more than that on it in the next 20 years. Investment be damned! The downside is they’ve become incredibly valuable and a lot of people are afraid to drive them. The upside is they’re so valuable they can almost never be totalled. If the only piece you have left after a horrible accident is the chassis plate, just take it to Woking and they’ll repair it. And, just like your Mustang or your MG, it even seems to run better right after you wash it. Despite its tortured history, this oddball 5-speed was once the fastest car in the world - and this particular XJ spent the last 12 years on the 37th floor of a Tokyo office building. Crash-test wreck made perfect. Epic Restorations 1989 Jaguar XJ220 Based on Jaguar Sport’s crash test dummy, this project was a real jigsaw. ‘We had to turn the shell upside down to replace the floor’. This Jaguar XJ220 was the MIRA crash-test car. Don Law Racing put it back together again… and gave it 800bhp. Words Russ Smith. Photography Jonathan Jacob. There’s an element of the lost supercar about the Jaguar XJ220. Nothing to do with the McLaren F1, more something related to the way it looks, which is too benign and maybe even a bit vacant for a car of such terrifying speed. Perhaps this is because at a glance the XJ220 appears to have no eyes, which in tandem with the gills at the base of its flush-glazed windscreen give it an otherworldly presence. One shudders to think of the havoc pop-up headlights would have wreaked on designer Keith Helfet’s fabulously supple lines, but it could well have happened. In fact, it’s exactly what the Saturday Club – an unofficial, out-of-hours band of passionate Jaguar engineers and designers who had seen the Ferrari F40 and thought, ‘Yeah, think we can beat that’ – were left to nervously contemplate when regulations prohibited the use of traditional transparent covers. But there were concerns that pop-ups would be slow to operate and unreliable – characteristics at odds with what was intended to be the fastest, most powerful and most expensive production car the world had seen. And in a car with minimal drag to complement its ground-effect aerodynamics, popping the headlights at any decent speed would have felt like re-entry. In the end, pop-up lights were a line the club simply wouldn’t cross. The eventual solution was beautifully simple, consisting of small body-coloured cover-panels hinged at the front that fell flat when the headlights were switched on. Helfet had come up with the idea for the long-running XJ41 project (the original f-type, some say, and certainly a basis for the supercar’s front-end design) and protracted fiddling eventually made it work, a small electric motor raising the covers once the headlights were switched back off. It wasn’t perfect, mind. With the covers down, the XJ220’s sculpted nose is left with two deep gouges, like when a pebble is lifted from damp sand. however, the mechanism itself is as slick as you like and, according to XJ220 experts Don law racing, reassuringly reliable. You can witness it in slow-motion during the music video for ‘Knock Yourself out’ by Jadakiss, the defining moment arriving just as the Grammy-nominated rapper leaves a garden party with what we can assume is his new girlfriend. It’s well worth a watch, the XJ220 being a refreshing choice of car for this kind of stunt (step aside, Lamborghini) and possibly enlisted on the basis of its inventive headlight covers alone.